Manassas, VA -- In 1945, a young Ralph Stanley joined his brother, the late Carter Stanley to form The Stanley Brothers, a pair that would go on to become one of the most influential music duos of all-time. They got their start calling into a local radio station in Norton, Va, where they would sing songs over the phone. After 7 decades, three Grammy awards and an induction into the Grand Ole Opry, Dr. Ralph Stanley has no intention on slowing down as he hits the 70-year milestone. To commemorate this accomplishment, he is playing a special show in Manassas, Va. on October 9 at the Hylton Performing Arts Center. He will be joined by his Grandson, Dove-award winner Nathan Stanley and the Clinch Mountain Boys for this momentous occasion. 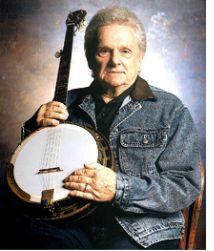 Nashville, TN -- Trailblazing musician Dr. Ralph Stanley has been elected a fellow in the humanities and arts category of the American Academy of Arts and Sciences in a class that also includes actor and director Al Pacino, novelists John Irving and Annie Proulx, Pulitzer Prize-winning cartoonist Jules Feiffer, former Secretary of Labor Robert Reich and oceanographer and discoverer of the Titanic, Robert Ballard, among others. Dr. Stanley will be honored in a ceremony taking place Saturday, October 11, 2014. Ontario, CA -- The Legendary Dr. Ralph Stanley will make what is right now his final West Coast performance at Huck Finn Jubilee as part of his “Man of Constant Sorrow: The Dr.’s Farewell” tour, event organizers announced today. His farewell performance will be accompanied by a spectacular lineup of performers which include The Gibson Brothers, The Del McCoury Band, Doyle Lawson & Quicksilver, Sam Bush, Junior Sisk & Rambler’s Choice, Rhonda Vincent, The Boxcars, Chris Jones and the Night Drivers and other top-name entertainment still to be announced for the June 13-15 jamboree, held at Cucamonga-Guasti Regional Park in Ontario, Calif.